In 2004, Finn Kydland and Edward Prescott won the Nobel prize In economics, In part for their work on the role of expectations in policy making. Odysseus legendarily had himself tied 10 tus ship’s mast before it passed the island of the Sirens, so that he could hear their entrancing song without Stengel his vessel to its destruction on the surrounding rocks. The deserving winners of this year’s Nobel economics prize. the Norwegian Finn Kydland and the American Edward Prescott. would instantly recognize this as a tine example of overcoming a time consistency problem by using credible commitment to follow an ex ante optimal policy. The independence of Europe’s central banks. along most others across the world, shows that, in the area of monetary policy, its politicians have largely absorbed the lesson exemplified by their mythical ancestor and codified by Kydland and Prescott. The work of the Kydland-Prescott duo has become synonymous with the idea that policy needs to be time consistent. If the public knows it is in the interest of policymakers to change direction in the future, decisions they make now will lack credibility. That insight underlies what is now an almost universal acceptance that monetary policy, the chief means of steering the economy, should be in the hands of independent central bankers focused firmly on long- term stability, not finance ministers keeping one eye on the next election, The public will always rightly be suspicious that even if interest rates are set to ensure law inflation today, it will be In ministers’ interests tomorrow to exploit the fact that wages have been set with that low inflation in mind and hence loosen monetary policy to steal a little more short term growth. The inability of politicians credibly 10 commit to an outcome of low inflation will thus in- fact raise expectations of inflation and mean interest rates have to b~ higher than otherwise. In other words, policymakers need to find ways of themselves to the mast now to prevent the damaging belief that siren calls will make them stray later. Establishing independent central banks that’focus on inflation is one such means. The events of recent months have shown the benefits in the US, the concur and the UK: Inflation expectations have remained subdued despite the rise in oil prices, enabling interest rates to stay low. Through careful policy design, Odysseus was’able both to hear the Sirens’ song and to avoid wrecking his vessel. Those steering the ships of state should learn from his example and the newly rewarded work of professors Kydland and Prescott. This time, the change in focus came not from two American economics professors but from a group of Arab sheikhs. In 1974, the Organization of Petroleum Exporting Countries (OPEC) began to exert its market power as a cartel in the world oil market to increase its members’ profits. The countries of OPEC, such as Saudi Arabia, Kuwait, and Iraq, restricted the amount of crude oil they pumped and sold on world markets. Within a few years, this reduction in supply caused the world price of oil to almost double. Panel shows the model of aggregate demand and aggregate supply. When the aggregate-supply curve shifts clothe left from ASl to ASz, the equilibrium moves from point A to point B. Output falls from Y1to Yz, and the , price level rises from Pl to Pz Panel (b) the short-run trade-off between inflation and unemployment. 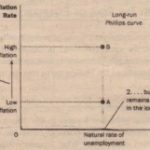 The adverse shift in aggregate supply moves e economy from a point with lower unemployment and lower inflation (point A) to a point with higher unemployment and higher inflation (point B). The short-run Phillips curve shifts to the right from PC! to PC. Policymaker snow face a worse trade-off between inflation and unemployment. This shift In aggregate supply is associated with a similar shift in the short-run Phillips curve, shown in panel (b). Because firms need fewer workers to produce the smaller output, employment falls and unemployment rises. Because the price level is higher, the inflation rate-the percentage change in the price level from the previous year-is also higher. Thus, the shift in aggregate supply leads to higher unemployment and higher inflation. The short-run trade-off between inflation and unemployment shifts to the right from PCI to PC2. Confronted with an adverse shift in aggregate supply, policymakers face a difficult choice between fighting inflation and fighting unemployment. If they contract aggregate demand to fight inflation, they will raise unemployment further. If they expand aggregate demand to fight unemployment, they will raise inflation further. In other words, policymakers face a less favorable trade-off between inflation and unemployment than they did before the shift in aggregate supply: They have to live with a higher rate: of inflation for a given rate of unemployment, a higher rate of unemployment for a given rate of nation or some combination of higher unemployment and higher inflation. Faced with such an adverse shift in the Phillips curve, policymakers will ask whether the shift is temporary or permanent. The answer depends on how people adjust their expectations of inflation. If people view the rise in inflation due to supply shock as a temporary aberration, expected inflation will not change, and the Phillips curve will soon revert to its former position. But if people believe the shock will lead to a new era of higher inflation, then expected inflation will rise, and the Phillips curve will remain at its new, less desirable position. 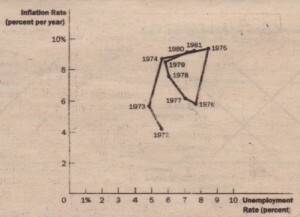 In the United States during the 1970s, expected inflation did rise substantially. This rise in expected inflation was partly attributable to the Fed’s decision to accommodate the supply shock with higher money growth. (Recall that policymakers are said to accommodate an adverse supply shock when they respond to it by increasing aggregate demand in an effort to keep output from falling.) Because of this policy decision, the recession that resulted from the supply shock was smaller than it otherwise might have been, but the US. economy faced an unfavorable trade-off between inflation and unemployment for many years. The problem was compounded in 1979, when OPEC once again started to exert its market power, more than doubling the price of oil. Figure 9 shows inflation and unemployment in the US. economy during t his period. 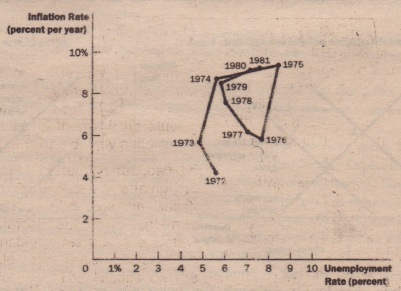 This figure shows annual data from 1972 to 1981 on the unemployment rate and on the inflation rate (as measured by the GDP defoliator). In the periods 1973-1975 and 1978-1981, increases in world oil prices led to higher inflation and higher unemployment. In 1980, after two OPEC supply shocks, the US. economy had an inflation rate of more than 9 percent and an unemployment rate of about 7 percent. This combination of inflation and unemployment was Dot III all near the trade-off that seemed possible in the 1960s. 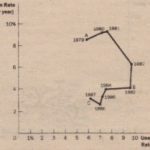 (In the 1960s, the Phillips curve suggested that an unemployment rate of 7 percent would be associated with an inflation rate of only 1 percent. Inflation of more than 9 percent was unthinkable.) With the misery index in 1980 near a historic high, the public was widely dissatisfied with the performance of the economy. Largely because of this dissatisfaction, President Jimmy Carter lost his bid for reelection in November 1980 and was replaced by Ronald Reagan Something bad to be done, and soon it would be.